Tee's corporation AKA BRIDE has released a new revolutionary reclining seat. The CUGA model is a full reclining model that still retains full bucket seat characteristics. Lightweight and plenty of holding power, the look of the seat is second to none. CUGA may seem like a name coined off a wild animal but its actually BRIDE's newest model that just has been released. This top of the line seat was developed to exhibit elegance while still providing plenty of holding power during those spirited driving times. 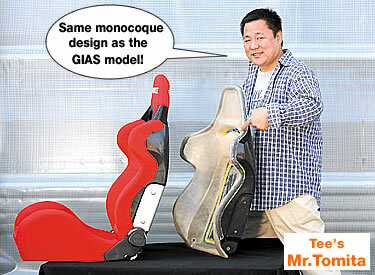 It's predecessor the GIAS model came equipped with a monocoque seat backing and provided full reclineability as well. However this new upgraded model remains significantly lighter, due to the construction of the pipe frame. The aramid fibers (cheaper than carbon, more elastic) used in the seat backing was lined with the look of carbon fiber to increase its rigidity and provide a luxurious feel to the overall design. This new seat weighs in 4 kg lighter than the BRIX series and the new technology used will surely aid in making more stronger and lighter seats in the future. A reclining bucket seat is specially made for daily driving hence the level of comfort cannot be substituted with anything else. 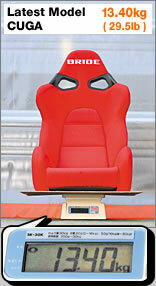 The comfort level of the seating is all dependent on the construction of the seat layer. In the past, BRIDE has been using steel springs in their construction. By using springs, the surface compression is very difficult to disperse, adding extra stress to the driver. The seat cannot be set at a low position as well. By utilizing springs which are most often made out of some metal, they were adding unnecessary weight to the assembly. The hammock construction hangs the cloth from the frame, absorbing the person's weight while still remaining lightweight. In addition, the center of gravity can be lowered like a real sports seat. As BRIDE's newest lineup of the reclining seat series, the CUGA is expected to aid in the development of future models. With this seat, we can surely expect BRIDE to further develop stronger and lighter seats that we can now only dream of. 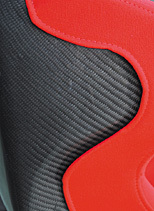 The monocoque backing is constructed from aramid fibers which were decorated to look like carbon. The material is more elastic but still provides plenty of rigidity. The reclining assembly was incorporated into the monocoque backing. This construction evolved from the GIAS series. The aluminum plate adds extra strength to the reclining assembly. The hammock design hangs the cloth from the tube frame assembly. For holding the driver's weight on the surface, it also does not add stress to the body. By using as little cushion as possible, the center of gravity is lowered to the max. 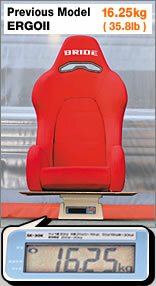 The biggest difference from the reclining bucket seat model GIAS is the one touch function on the front of the seat. 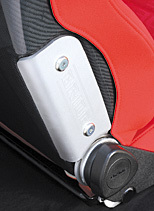 The seat can be easily adjusted even on a 2 door vehicle. Comparison with the previous model! It's very difficult to find a lightweight reclining seat but what makes this new CUGA seat special is that it emphasizes on its lightness. Comparing it to the previous reclining model ERGOII, there was a 3kg (6.6lb) difference. When we compared to the larger seat BRIX, there was more than 4kg (8.8lb) of weight difference.